Keltruck staff battled the bad weather to help support local school, Delves Green Infant & Junior, during their 2007 Summer Fete. Keltruck’s Neil Vazey, Sally Vazey, Margaret Green Morris & Kris Benbow joined members of the Delves Green PTA and were on hand to show parents and children inside a brand new R-Series tractor unit and to raffle off a remote control truck which alone raised an additional £80 which will be put towards school funds. 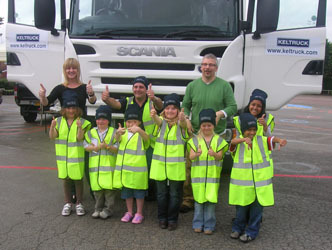 Keltruck have also offered to support Delves Green Infant & Junior with their ‘Walk to School Campaign’. The campaign is derived from a government initiative to ease congestion outside schools and get youngsters exercising. Children involved in the campaign are now dropped off by parents at a nearby car park and walk the remainder of the way to school while being supervised by staff and volunteering parents. 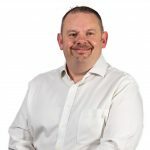 Keltruck have supplied the school with a number of high visibility vests to ensure the safety of the children while en route to their morning class.